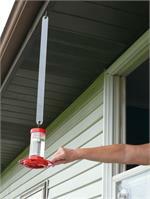 Item #802-24 is a Bird Feeder Hanger Extension that makes it easy to hang and retrieve feeders located outside a window, or on a porch. Using either the included screw in J-hook or one already in place, simply insert the hook from your feeder into the lower hole, then holding the lower end, insert the upper hole into the hook (see pictures). This keeps the feeder away from the house a bit, but still close enough to see hummingbirds and other others up close. It's just as easy to retrieve by reaching out and unhooking from the top hook for easy refills of nectar or seeds. 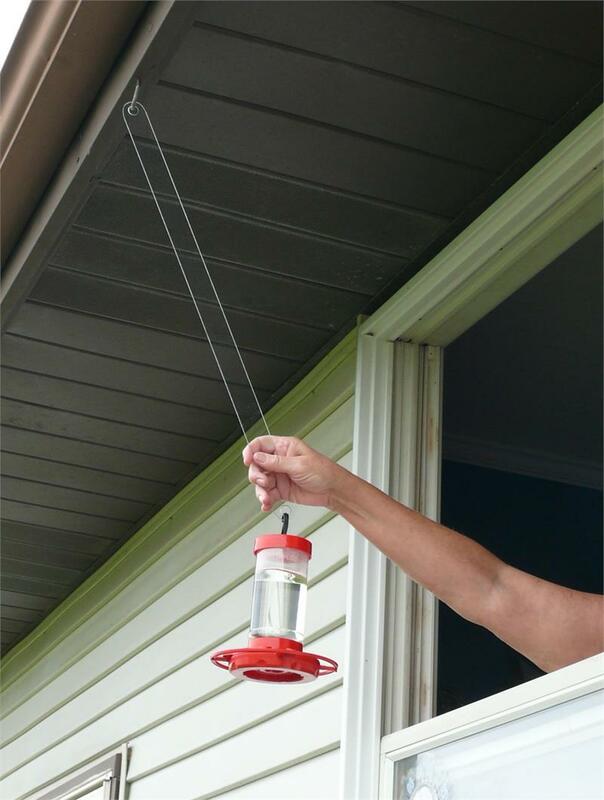 We use these hangers outside the kitchen and dining room windows for hummingbird feeders & get to see our regular visitors watching us as we watch them! Since the hanger is clear and fairly rigid, it does not block the view, but is very easy to hang and retrieve. 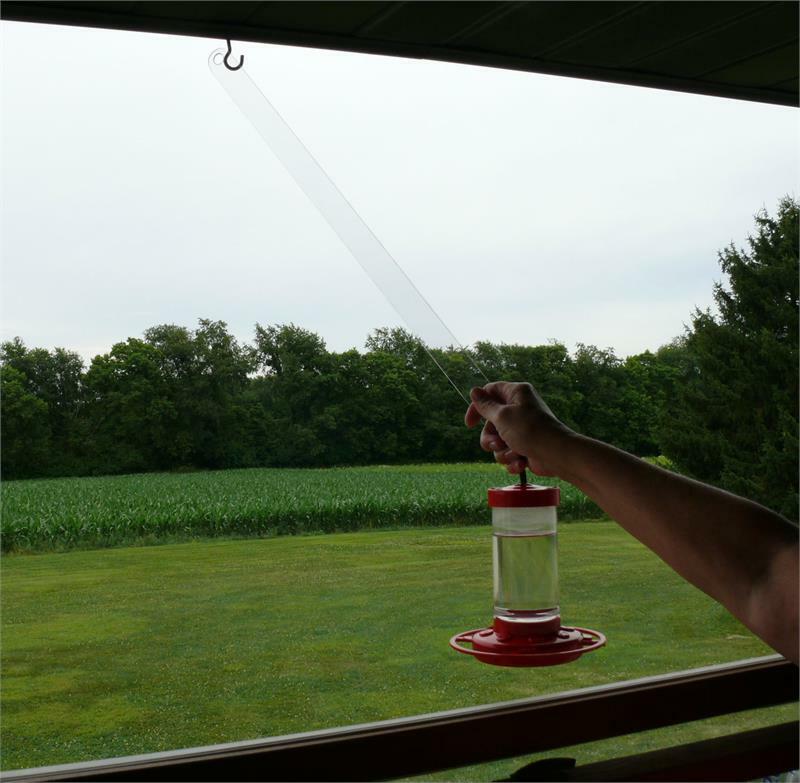 Choose the proper length by how far away the hook is & how far down you want your feeder to hang. Example pictures show a 18" hanger extension which works well in this setup. The 24" extension also works to get a shorter feeder closer to eye level in the dining room. 12" hangers are appropriate if hung closer in (from the eaves) or other closer in easily reachable situations. Two (2) 24" Hangers and two (2) Screw in J-Hooks are included. Hanger is 24" long x 1-1/4" wide x 3/32" thick, with 1/2" hole at each end. Made from Lexan which is 250 times stronger than glass & virtually unbreakable, plus it is UV resistant for long life. J-Hooks are ¼” Dia. x 4-1/4” Long & Zinc Plated. Available without screw in hooks, please see item # 801-24. Also available in 12" (item #801-12) and 18" (item #801-18) lengths, with and without hooks.